Think different and work for Samsung. Working for Apple’s biggest competitor and thinking like Steve Jobs wanted us to. After Samsung released its latest Galaxy commercial this week, I could not help but notice some annoyed, even angry, comments from the Apple fanbase. While I concede that the commercial is a bit over-the-top (how about that haircut of the Apple fan waiting in line?) I personally feel that Samsung is entitled to commercialize the Galaxy’s advantages and give Apple a run for its money. After all, that is what companies do when their competitors launch new products known to generate high wave of style addictions and long lines around the world. Now, before you all conclude that because I work at Samsung I must be biased, I have to publicly confess that I suffer from an uncontrollable technology addiction, and as a consequence I am the keeper of a vast device collection. That shelf includes gear from Apple, OnePlus, Huawei, Google, and of course Samsung. The absolute star of the collection is the very first generation iPhone put into production, still in its glamorous black box, complete with all accessories and Apple’s very first stickers. The truth is that I have always loved Apple products. My father was an architect and the best tool in his design firm was an Apple II, with which he compiled project information, made simple engineering calculations, and most of all showed off to his clients. To this day, the most beloved gift I ever received from my family was a beautiful cream-colored Macintosh LC II, with its corresponding 12' inch monitor and small inkjet printer. That very gift was my first inspiration to become a designer. Talk about a brand’s impact on a life. The list of Apple devices I ended up owning in the years to come would be too long to include here. Among them were a few large purchases that needed hefty loans and years to be paid, but also many smaller ones, which were generally the result of impulsive purchases. Even today, while working at Samsung and happily using a gorgeously made Galaxy S8+, I am still the proud owner of a brightly covered iPhone 7 which is reserved for my personal use. And yet still, even while I am writing this, I know at heart, that my Samsung S8+ is indeed a better piece of technology than my iPhone 7 and perhaps even better than Apple’s newest creation, the iPhone X. Of course that is a matter of opinion. But if we assume that is true, then why do we not frantically wait in lines when new Samsung products go on sale? Apple’s initial ethos was to purposefully design products with obsessive simplicity and engineering prowess. Those qualities at the core center of their product strategy, revealed themselves to be highly addictive and to persuade a small community of computer users to become, quite literally, religious followers. After a few years, many of those initial followers became true product evangelists, spreading Apple values beyond their very own capabilities, and using the products’ differentiation as emblems of their own personalities. If you used a Macintosh then, you surely were someone special, and however hated and derided by the Window users at large, you surely stood out of the crowd. We all wanted to be different, following the historic heroes that TBWA put together with Steve Jobs’s help. We were inebriated by the almost mystical proposition of this provocative new brand. Indeed, when the first generation iPhone exploded into the market, I myself felt I had acquired my own technological temple that I could carry in my poorly mended pockets. It could take pictures, play my songs, and most of all would give me the opportunity to show off my Apple addiction. Then came Android. It seemed then the perfect way to detox from iOS and move on from the very first technological underdog to adopt a fresher one. Different was becoming the norm then with the help of the sudden death of the Blackberry, and at some point I decided to taste the other side myself. While I initially did not feel the same affection as I did for iOS, I took the plunge and extended my addictions to other brands and devices. Samsung was a small fish in Apple’s pond when the Galaxy series came to market. Over the years, with a lot of hard work, the Galaxy grew larger and larger, establishing itself as a phone truly open to everyone else (who did not have an iPhone). Then when Samsung unveiled the Galaxy S7 in 2016, the world sat up and took notice. Even during the terrible debacle of the Note 7 later in the year, the company reached out to users to apologize, give them new phones for free, and quickly go through an unprecedented process of product rehabilitation. When Samsung unveiled the Galaxy S8 in April of this year, among the folks and colleagues working with me in the confined product launch room, there was a palpable excitement that I had not yet seen in my career. This wasn’t just another smartphone, this was truly a technological marvel, that made everything that before it — even the iPhone — instantly look like a religious relic. It is no longer universally acceptable to claim that the iPhone is superior to the Galaxy S8 or Note 8. 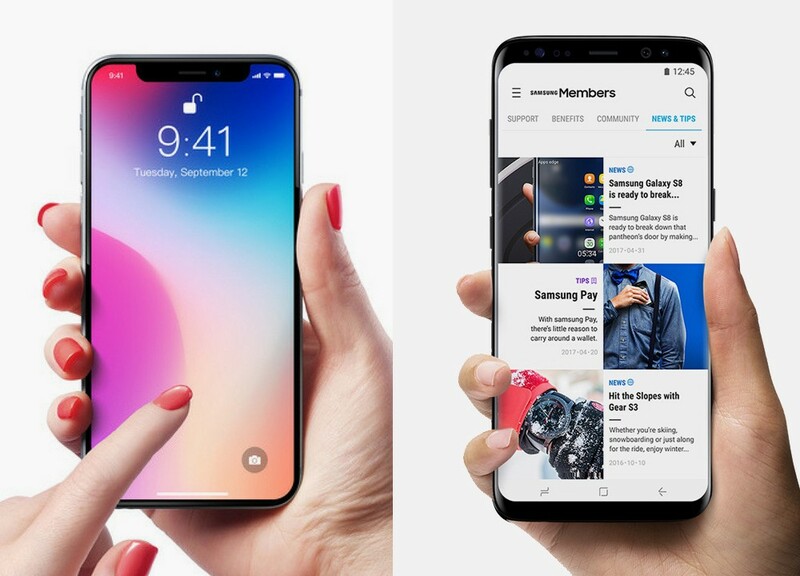 Surely Android has a long way to go to perfect itself and achieve the simplicity and sophistication of Apple’s iOS, but if you compare the technological specifications and even hardware design of each product, you cannot deny the excellence of Samsung’s devices. Samsung’s design and manufacturing standards are truly outstanding, and moreover, the interface design, created in close collaboration with Pentagram in New York City, represents a true testament of Samsung’s dedication to design excellence for the future of its products. Of course, I too am waiting for a brand-new iPhone X that I was lucky to acquire through a carrier upgrade (yes, one of those carrier offers you truly can’t refuse). However, I feel incredibly blessed to work for a company that creates products without the cult-like religion behind them. We don’t have stores with huge, heavy doors and high ceilings that look like churches. Our own geniuses don’t dress all the same or wear the same tags. We just create technology that improves people’s lives and do our best to keep ourselves grounded while doing it. I know this may sound like an open critique of Apple’s products and fans (I am one of them); however, it is really not. I love, as many millions of others do, to enter the Apple store, to touch and gawk at all the fantastic products, to wander over to the accessories and chat with the experts while absorbing the applications of the laws of simplicity around the walls. Apple’s retail experience is truly magical, and the technology of its products truly matches that. However, we all need stiff competition in order to achieve great success, so I am extremely glad to work for a company that has turned such fierce competition into amazing product growth, and has given me the chance to work with so many truly amazing people. 45% American, 45% Italian, 10% Fish. Design Director, Digital Design Senior Manager at Accenture Interactive.